There are many books I believe are essential in a pastor’s library beyond a sturdy, leather-bound Bible. There are the classic works such as The Pilgrim’s Progress, Foxe’s Book of Martyrs, and Paradise Lost. Along with these, a good Hebrew and Greek lexicon or two will help immensely in sermon preparation. I would also recommend sermons from great preachers throughout the history of the church. I now must recommend another book that will be an incalculable benefit to any pastor (and layperson), and it is Desiring God: Meditations of a Christian Hedonist by John Piper. The current book under review is the revised edition. It is in fact a 25TH anniversary printing of the book. A book with so many years under its belt that continues to have the impact and energy to stir the heart is a rarity. Piper approaches his material from a thematic angle, seizing upon the various aspects of the Christian life to support his main thesis of Christian hedonism. Important areas such as worship, prayer, marriage, and missions are addressed to build Piper’s proposal that Christians must pursue their pleasure in God. Such a premise may sound odd to many Christians who believe they do seek their joy in God as an important component of their daily life. However, Piper does not present this pursuit of joy as a component, but the very foundation upon which the Christian life is built. There are elements of exegesis in the book that Piper develops to show that he is not throwing an obscure theory against the wall and hoping it sticks. He is a competent exegete, but Piper’s true strength lies in his usage of historical works. He introduces the reader to an assorted gallery of classic Christian authors, philosophers, and pastors. Anyone familiar with church history will know many of the names, yet Piper sheds new light on their personal theologies and writings. The writings of powerful figures such as Jonathan Edwards and C. S. Lewis are used with great efficiency. Piper also shows a familiarity with the early church fathers, a familiarity that is often lacking with modern Christian writers. The most compelling characteristic of the book is its embrace of the true Christian life. Piper does not expound upon deep truths as an ideologue addressing a crowd of sycophants. Nor does he take an exclusively pastoral approach that reeks of “preachiness” and judgment. Piper exhibits himself in his full humanity. This only makes Desiring God more approachable as a reader and certainly made me more open to thinking upon Piper’s presentation. I highly recommend this book. It will be a great resource for anyone with any level involvement in ministry. This revised edition includes a study guide for personal use or in small groups. It is a wonderful resource for a Bible teacher. Its utility extends beyond classroom usage. 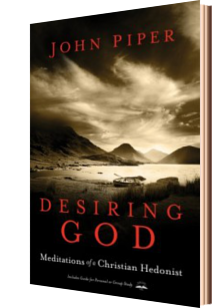 Desiring God will make a great personal devotion study as well. Piper’s pastoral spirit comes through nicely, and while the subject matter is profound, the work never comes across as pretentious. Piper has built his many years of ministry upon the foundations he establishes in Desiring God. It is a carefully executed and wonderfully written piece of literature. Having read dozens of missional and personal theologies through the years, I believe Desiring God will be in service by the church for many years to come. In fact, when it celebrates its next twenty-five year anniversary, I quite expect it to have reached “classic Christian literature” status though I believe it is certainly deserving of the title today. FTC Disclaimer: I received this book for free from Waterbrook Multnomah Publishing Group for this review through their Blogging for Books program.